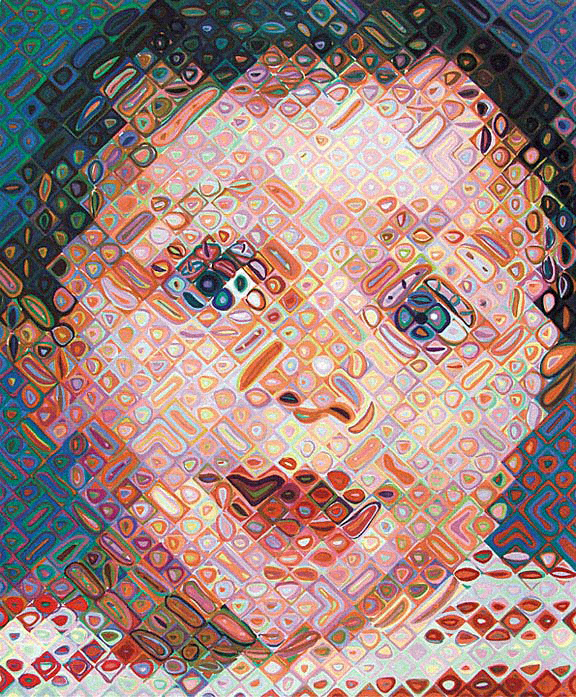 Chuck Close is an inspiration. His work has pattern, repetition, and geometric shapes. Three of my favorite elements of art. It reminds me of quilts. His work is one thing up close and another from farther away. Another part of Chuck Close that I find inspiring is his personal story. As a child he was in special education classes. He had difficulty learning because of an undiagnosed learning disability. He certainly overcame that. In 1962 Close received his B.A. from the University of Washington in Seattle and in 1964 he received his MFA from Yale University.Another hage obstacle Close has overcome is that in 1988 he suffered a a spinal artery collapse that left him a quadriplegic. He has relied on a wheelchair ever since. He creates his giant paintings with a special apparatus that moves him up and down to reach all of the canvas, and with a paint brush strapped to his wrist. I find this amazing and hope you do too. Posted on January 17, 2013 by carolnesper. This entry was posted in Artwork, Chuck Close and tagged chuck close, paintings, photorealism. Bookmark the permalink.